And I LOVED it! I could barely put it down for the couple of days that I read it. In fact, a couple of days I was running late to work because I was reading it while blow drying my hair and couldn't put it down when my hair was dry! 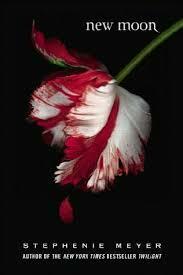 Then I read New Moon, the second book in the series. It was like slitting my wrists with a spoon for the first 300 pages..... So BOR-ing! But then it started picking up the last 300 pages. It was no Twilight, but at least all 600 pages weren't lame! 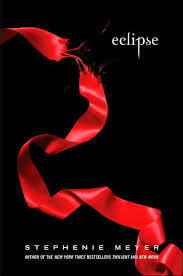 Now it is time to read Eclipse, the third book in the series of 4. Zowie couldn't find that one, so I need to go to the library to borrow it. New Moon had the first chapter of Eclipse at the very end so I got a bit of a taste of it. I am very anxious to get started! This weekend Twilight the movie came out. Lots of people went at 10:30 on Thursday night to see it and even more are going this weekend. So far I have heard at least one good review from a teacher I work with, and I know a couple other people that went/are going so I look forward to hearing from them. I'm hoping a certain someone blogs about it....maybe even with a picture of the shirts she made! I'm a little skeptical about the movie because the previews look really dark and scary and the characters are not how I pictured them....but I still do want to see it! 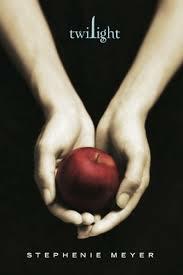 I loved loved loved the books and was at the midnight release party for Breaking Dawn. I thought the movie was worth seeing but it's not an award winning movie if you ask me. I think if you've read the books then you'll appreciate the movie...but then again, if you've read the books I'm pretty sure the movie won't live up to your expectations...but I would say see it. And make sure you tell us what you think!!! !